Time to put your swinging skill on the test once again in Pinata hunter 2, this time it’s more fun and entertaining than ever before, the game has many weapons and items starting from simple sticks to even sci-fi light saber and small paper bags to large trailers. 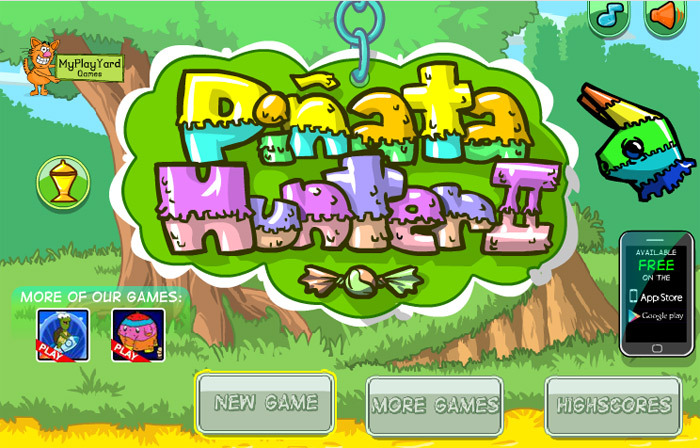 Are you up to the challenge of smashing those pinata into pulp and hoard all those candies for you, if you feel its time you are ready for the action then Pinata hunter 2 is the perfect game for you. The control of the game remains similar to the earlier sequel and very easy to pick up. The game only requires a mouse to play with. 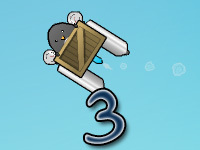 By clicking and holding the left click you will be able to drag the bag to your desired place. Moving the mouse makes you swing your weapon. 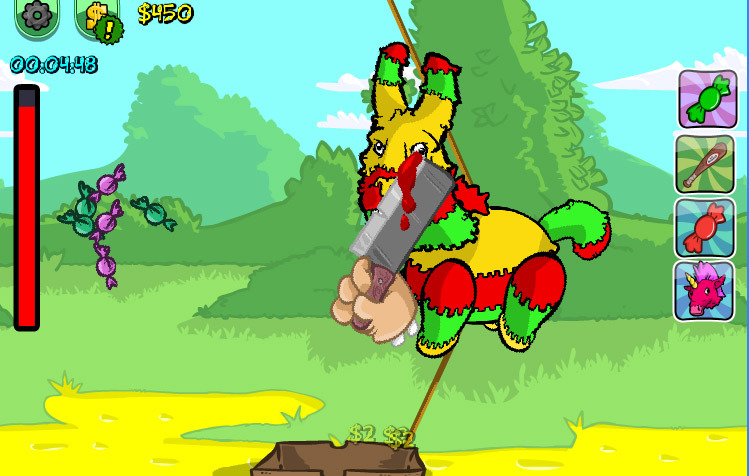 Like the previous part Pinata hunter 2 provides you with mind blowing fun and entertainment. With the mixture of old and new features the game goes to a whole new level of entertainment. 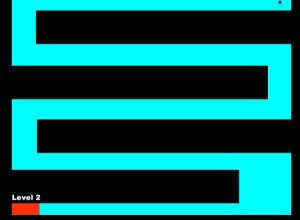 In this sequel the latest feature of the quite fun to play around. Test yourselves how well you can do with those colorful figurine. This time the pinata are no longer indestructible they can be damaged with a certain amount of hits. Every time you destroy a pinata another one replaces the old one and comes to challenge your skill again. The paper bag is now more important than ever, each bag can contain certain amount of candies, if the bag’s limit becomes full with candies you won’t be able to use the bag for gathering the candies so you will have to purchase items from shop to empty your bag. 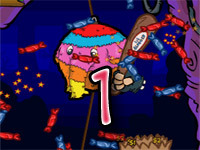 Light saber – Its time you use your jedi skill on those pesky pinata and get all the candies they can offer. Light saber is a very strong weapon each hit can assure a huge amount of candy drops. 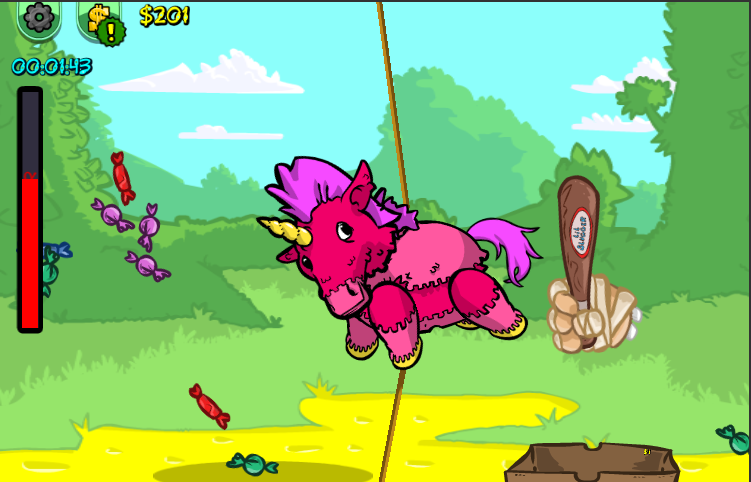 The shop sells a variety of colorful sabers, so pick one and start slashing those pinata into tiny pieces. Trailer – Tired of small paper bag having a hard time collecting those delicious candy? Well worry no more this giant trailer is like anendless pit and it’s so huge in size that makes the gathering of candy very easy. It’s a giant trailer after all so buy it soon and start having fun in harvesting those candies. Hulk hands – As the name suggests these gloves are really strong like the hulk. This gloves offers you massive boost on the strength of your weapon and decreases the chance of getting spasm. With these gloves you have the potential to collect a large amount of candy without worrying much about the hand spasm. 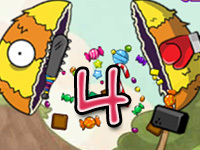 The score system remained same, like the previous franchise the score increases with the harvesting of candy the more candy is collected the greater the score will be, candy also works as means money to buy upgrades, items from the shop. So try to gather as much score as you can if you wish to obtain those beautiful upgrades. The achievement feature remained intact like the previous game, but this time lots of new achievement has been added for example destroying each pinata gives you an achievement and new hidden trophy for achievement has been added as well, you have to use your brain to find the hidden reward that’s in the game.